In the Fall of 2013, my wife and I traveled on the Crystal Symphony for a marvelous Fall Colors voyage. Although it got cold up north in October, we had a great time. Upon arrival, we spent one day in Quebec City. The quaint downtown offers many shops to view. A quiet stroll along the old streets provides a change from other busy streets. I love to take photos of “odd” things. This one of a bike locked up was a bit of a mystery. The small cover says “No parking” – but is that for cars nearby or the bike? Or is it reserved just for bikes? 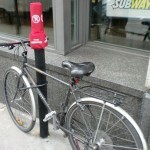 Seems odd to put up a pole only to not allow locking a bike to it. But the cover seems too small to warn cars. 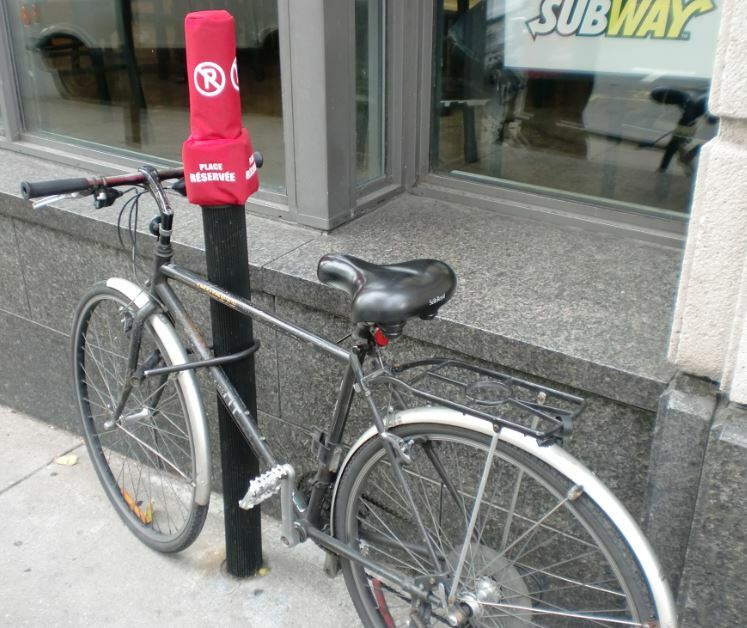 My guess was that it was indeed for parking the bike. It looks like it has a large Kryptonite lock. At first I thought a thief could just raise the whole bike and lock vertically and remove the bike…but the top of the pole appears to be a bit larger that the lock – so all is well. Another thing – note the fenders, signifying that the person rides in the rain a lot. Without them, the rider would get a streak up the back. Also note the good seat. The slight indent in the middle makes for a … well, let’s say healthier ride. Finally – see the Subway. Ahhh, 1 footers for $5US. If you are a cruise ship speaker, you can bring a bike aboard to peddle around town. What a hassle though. I don’t recommend it as you will have plenty of diversions.